The essential guide to tax on your buy to let property..claiming allowable expenses and allowances. If you’re a landlord it is important that you understand what tax you are liable for. Our guide tells you everything you need to know about the rules for income and capital gains tax when you let a property. People who receive rent or income from land and property in the UK are required to complete a tax return. Therefore the first thing you would need to do is to inform HMRC that you are receiving property income by 5 October following the end of the tax year in which you received the income. The UK tax year runs from 6 April to 5 April the following year. Therefore, if you rented out your property on 1 March 2019 you would need to inform HMRC by 5 October 2019. If you do not do this you may be charged a penalty. You should inform HMRC of your property income no matter whether you are making a profit or a loss from the property. But you pay tax only on your net rental profits – that is, your rental income, less the allowable expenses (deductions) of letting. So if you have no profit, you will have no tax to pay. UK property income is entered on the UK property pages of the tax return. On your tax return you enter the income and the expenses. If your rental income is higher than your rental expenses, you are only taxed on this amount which is your profit. If your rental expenses exceed your income, you have made a loss. If this happens you should take advice as this is a complicated area. Any profit from property is added to your other income of the tax year. If you are a basic rate taxpayer, you will pay 20% income tax on your rental profits. National Insurance is not paid on rental profits. The tax due is collected under self-assessment – usually a tax bill due by 31 January each year. This is the total amount of rent money you receive from a tenant or a lodger (or from organisations such as the local council on their behalf) before deducting any expenses. For example if you receive rent of £500 per month from the tenants of a property you own, the total rental income for the year would be £6,000. You can deduct certain expenses from the total rental income. The tax you pay is based on the rental income figure after deduction of expenses. You may only deduct expenses that are the result of letting out the property. There are special rules for some types of expenses – especially property repair costs. If you have several properties, all rental receipts and expenses can be lumped together, so expenses on one property can be deducted from receipts on another. The main property expense for most people is the mortgage payment. You can only get relief for the interest part of the mortgage payment. If you have a repayment mortgage, the repayment part of any payments does not qualify for relief. This means that the mortgage interest may be less than the full monthly repayment you make, as your mortgage repayments may include repayment of capital. If you remortgage the property to withdraw equity or secure the loan on a different property you may still be able to get relief for the interest but you should seek further advice as this is a complicated area. When the last chancellor George Osborne announced the change, he implied that the extra tax would hit only higher-earning landlords. It’s true that every mortgaged landlord who pays 40% or 45% tax will indeed pay much more under his proposals. But some basic-rate taxpayers will also pay more tax – because the change will push them into the higher-rate bracket. At the heart of the change is landlords’ future inability to deduct the cost of their mortgage interest from their rental income. In other words, tax will be applied to the rent received – rather than what is left of the rent after the mortgage interest has been paid. Here is a worked example assuming the landlord pays 40% tax. Your buy-to-let earns £20,000 a year and the interest-only mortgage costs £13,000 a year. Tax is due on the difference or profit. So you pay tax on £7,000, meaning £2,800 for HMRC and £4,200 for you. Mortgage arrangement fees also qualify for relief if either paid up front or added to the cost of the mortgage. The new rules above also apply. replacing roof slates, flashing and gutters. But you cannot deduct expenditure on improvements, or expenditure needed to bring a property up to standard before the first letting. Expenditure on improvements can be added to the costs of the property and may reduce any capital gain when you sell the property. The dividing line between improvement and repair can be difficult to judge. For example, if the windows needed replacing in the property you own, but you replaced single glazed windows with double glazed windows, is this a repair or an improvement, or a bit of each? In cases like this, you will be allowed the normal ‘modern equivalent’ – so double glazing is accepted as a ‘repair’ and you can deduct all the costs against your rental income. Replacement with a similar standard kitchen, which counts as revenue and is allowable. Replacement with a new kitchen of the same standard, but with changes such as additional cupboards or extra equipment, which equates to a reasonable apportionment, with the “add-ons” treated as capital not allowable. The substantial upgrading of the whole kitchen, for example with high-quality materials and fittings, where the whole expenditure will be capital. If you are letting a furnished property, and it has sufficient furnishings for the tenant to be able to live there without providing anything more, you are allowed a deduction of 10% of the gross rent for the cost of the furnishings and equipment. PLEASE NOTE: For furnished property the Wear and Tear Allowance was abolished on 6th April 2016, it has been replaced with a new repairs and renewals basis, this means on the actual cost of repair or renewing an item can be claimed. This will apply to all rental property whether furnished or unfurnished. If the property income you have is from lodgers, there is a special scheme you may choose to use. It is called the Rent-a-Room scheme. To qualify you must have one or more lodgers living in your home. By a lodger, HMRC means someone who is living with you as a member of your household, but paying you to do so. If your ‘lodger’ has a separate front door, kitchen and other facilities, then this would not qualify for the Rent-a-Room scheme. You are given a flat ‘deduction’ of £7,500 per year against your rental income. This means that if your lodger pays you no more than £7,500 in a year, you have no taxable rental income. If your lodger pays you more than £7,500 then you may still use the Rent-a-Room scheme if you like, but instead of deducting the actual expenses you have made in connection with your lodger, you simply deduct £7,500 from your income. If you have high costs, such as a large mortgage, you may find that the actual expenses which relate to the lodger – including a proportion of your mortgage interest – are more than £7,500, so you would pay less tax using the standard rules for a property business as described in the sections on income and expenses above. The Non-resident Landlords Scheme is a way of collecting tax due on the UK rental income of non-resident landlords (those who own property in the UK, but do not live in the UK). Moving abroad and letting out your home or another UK property? If you are moving abroad but are going to rent out your old home, or any other UK property, it is important to realise you remain liable to UK tax on those rents and will still need to complete self assessment tax returns. You will also need to consider if you want to register for the non resident landlords’ scheme. If you do not register, your tenant or letting agent will deduct tax from the rent you are due to get. You then claim to offset this tax against any tax owed on your self assessment return. If you receive property income, you have to keep records and keep them for 6 years. A simple single entry cash book or simple computer spreadsheet or accounting system is enough. But it must be kept up to date. You will need to keep all the necessary paperwork to back up your cash book or computerised records. It is sensible to have a hard copy of essential information in case your computerised records are damaged or lost. This includes bills you pay and copies of the rent receipts/invoice you send to your tenant. If you use a letting agent make sure you keep all the statements and other documents that they send you. If records are poor, it will be very difficult to challenge any claims by HM Revenue and Customs during a tax enquiry that you have not included all your income or have made deductions for non-property related expenses. Furthermore, accurate records make it much easier to actually fill out your tax return correctly and quickly. There are special tax rules for jointly owned property for married couples and civil partners. The rules mean that you can’t simply decide between yourselves how you want to be taxed or, for example, just give the rental income to the member of the couple with the lower income. The tax rules say that income from jointly owned property must be split and taxed in equal shares. Only in exceptional circumstances can a different split be used. This is when the property is owned in unequal shares and so income is divided in the same proportion. 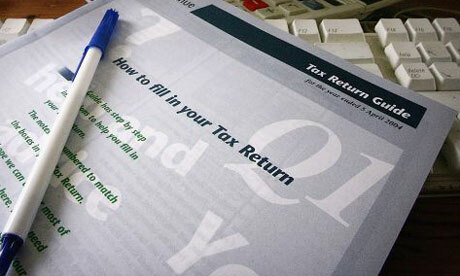 Completing your Tax Return correctly, without hassle, may not be an easy task and also can be time consuming. For just £130.00 (after tax relief £104.00) we can prepare and file your Tax Return for you without any fuss and ensure you claim all the expenses you are entitled to, saving you tax. Simply provide us with the information we ask for then leave the rest to us. Contact us or register and start using our online service for free. The material in this article is for general information only and does not constitute investment, tax, legal or other form of advice. You should not rely on this information to make (or refrain from making) any decisions. Links to external sites are for information only and do not constitute endorsement. Always obtain independent professional advice for your own particular situation. No problem, click here to contact us.